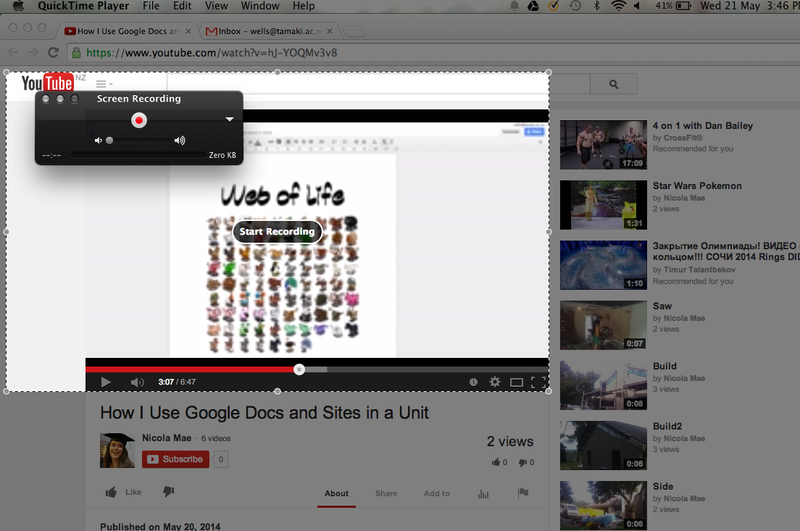 This is how to make a screencast on a Mac using Quicktime because Quicktime is free! Screencasts record the movements on your computer screen and can also optionally record your face, your voice and the sound of your clicks. Screencasts are great for creating how-to instructional videos for your students - how many times have you explained how to create a new doc? Or search on Google? Or tried to explain to your Aunty over the phone how to find a lost email draft?? Create a screencast and just send them the link! The first thing you need to do is to find the Quicktime player using Spotlight in the top right hand corner. You will click to open Quicktime and may be confused because nothing obvious appears to happen. However all that happens when you open Quicktime on a Mac is the bar at the very top of the screen will change to show Quicktime player. Click on File and select which type of recording you want. Movie Recording will include film from your webcam. Audio is just sound. 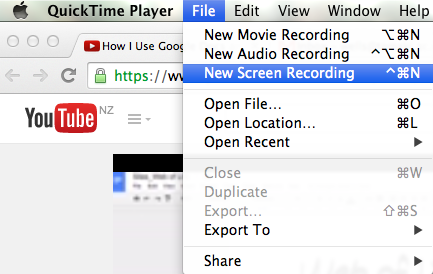 To screencast without your face select New Screen Recording. This box will open. Click on the little downward facing arrow to check the settings before recording. To screencast without sound select None for Microphone, for sound select Built In Microphone. If you want your clicks to be particularly obvious select Show Mouse Clicks in Recording. Once your settings are sorted you can click the red record button. You will get the option of clicking (to record your entire screen) or you can drag and select a smaller area. Perhaps you do not want all of your tabs visible? To publish your screencast select the tiny right-facing arrow on the right hand side of the black box, and select Youtube. Log into your youtube account, and the video will upload to it!